Recorded as Holkham and the dialectals Holcam, Holkam, Haulkham and others, this is an English surname. It is locational from Holkham in Norfolk, deriving from the pre 7th century word "holc" meaning a hollow or valley and "ham", a homestead or village. Locational surnames were amongst the first to be hereditary from about the time of the Norman Conquest in 1066. Originally they were given to the local lord of the manor and later as easy identification of a stranger, to people who left their village, to move somewhere else. In this case the original recordings clearly relate to landowners and include Peter de Holkham in the charters known as the Feet of Fines for the county of Norfolk in 1228. This was a list of taxes to be paid, and did not imply that the nameholder had been upto no good, whilst in the city of London Gerrade Holcomb married Anne Bourde at St. Mary Somerset, on December 5th 1594. 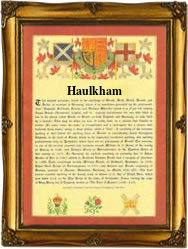 The first recorded spelling of the family name is believed to be that of Bertram de Holkham. This was also dated 1228, in the Feet of Fines of Norfolk, and he may have been the brother of Peter de Holham (above). This recording was during the reign of King Henry 111rd of England but known as "The Frenchman", 1216 - 1272. Surnames became necessary when governments introduced personal taxation. In England this was sometimes known as Poll Tax. Throughout the centuries, surnames in every country have continued to "develop" often leading to astonishing variants of the original spelling.